The Temple of Somnath Jyotirlinga at Gujarat, India !!! 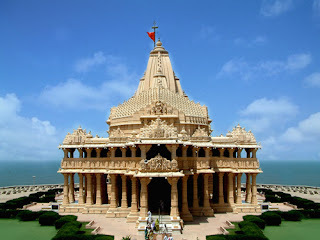 Somnath Patan, it is situated veraval in Gujarat it is the famous and great reverence in all India. 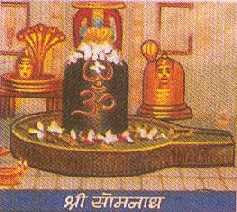 It has 12 Jyotirlingas of Lord Shiva, which is very inserting to know. In Gujarat it is situated on the south coast of Saurashtra. Skanda Purana was the chapter of Prabhasa Khanda in which full of describe was written about Somanth. About this the legend was it the Lord Shiva has in the old aeon was referred as Mrityunjaya, Kaalagnirudra, Amritesa, Anamaya, Kritivasa and Bhairavanatha at there in Somnath. Our next comming tipic is Shiva Moon, Shiva Lord and his sitting and going to also put some Shiva MP3The fact of legend is that Kalabhairava Shivalinga was at the Prabhasa was doing the worshipped of the moon, at that time Lord Shiva was in the Somanth. The Skanda Purana was described the most attractive Sparsa Linga of Somnath which is looking like a bright like a sun, his size is egg type and had lodged it in to the underground. Mahabharata was depending on this refer which the Prabhasa Kshetra and there also we can here about the moon worshipping of Lord Shiva. This fact and all this story about the Somanth was described by a Arab traveller Al Biruni, which has prompted his account by Mahmud of Ghazini was at that time destroyed the temple in 1025 CE. This news was immediately gone to the most famous king of Gujarat her name was King Bhima and King Bhoja of Malwa. In the second time also this temple was not lucky and it destroyed again by Alaf Khan, he was the general of Allauddin Khilij in the year 1300 CE. And also in third time by the king of Mahipala of the Chudasama dynasty. Its bad movement is stand in front of his it was destroyed so many time in the year 1390, 1490, 1530, and finally in 1701 it was destroyed by Aurangazeb. It was build rapidly in every time when it is destroyed. At last in the year 1783, the most famous queen Ahilyaghai Holkar had given a new face to the temple. And after in 1951 the president of India had setup the Jyotirlingam of Lord Shiva in the same Bhramasila were old temple had been built. Very important point is that the queen Ahilyabhai Holkar installed the Kasi Viswanatha temple in Benares and the second temple which is Vishnu Paada temple at Gaya, which is destroyed by the earlier. This article is well written as it has so many pictures and it actually sums up everything i needed for my project. nice . i like it. i didnt have any project but i also wanted to know about somnath and his temples. pretty informative article. i must say =D !!! KEEP WRITING WE NEED ARTICLES LIKE THIS.